In the summer and fall of 2015, the year that marked the beginning of what later became known as the refugee crisis, 1.1 million people arrived in Germany with the goal of seeking asylum. When taking a critical look at the way refugees are portrayed in media and public discourses in Germany, it is striking to note that the diversity  and the individuality  of these newly arrived persons is often reduced to certain stereotypes that go hand in hand with specific privileges and (moral) rights that are granted or denied them. Furthermore, women* are often absent in these images and discussions, and hence their specific experiences, realities, vulnerabilities and needs  not only during their flight but also after their arrival while living in refugee camps  often remain unaddressed. This is all the more critical as according to the UNHCR, the percentage of refugee women* and children arriving in Greece and seeking asylum in the European Union increased from an estimated 27% in June 2015 to 55% in January 2016. 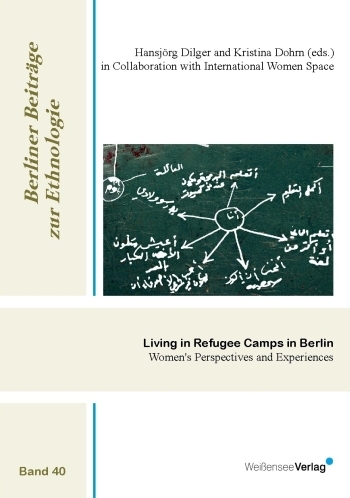 This book provides insights into the various ways in which women* perceive of and experience their living conditions in five different asylum accommodation centers in Berlin. In particular, it explores how women*  who have fled from countries such as Syria, Afghanistan, Eritrea and Albania, and who have diverse socio-economic, linguistic and educational backgrounds  describe their lives in the camps with regard to health and care, administration and registration, social interactions and support, and safety and privacy. The ethnographic research on which this book is based resulted from a collaboration between students and lecturers of the Institute of Social and Cultural Anthropology at Freie Universität Berlin and the Berlin-based group International Womens Space. 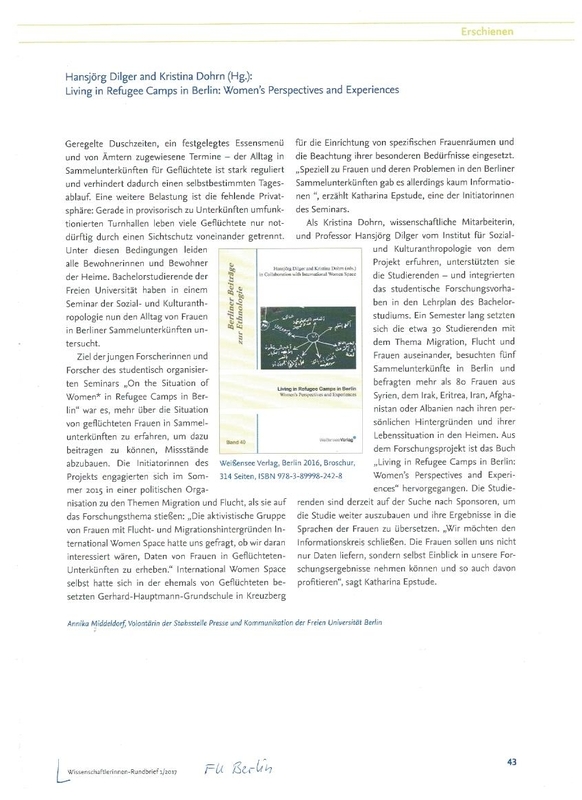 In this regard, the book aims to contribute to the improvement of the living conditions of refugee women* in Berlin and simultaneously hopes to provide a model for anthropological engagement in the face of increasingly complex socio-political challenges..
Hansjörg Dilger is professor of social and cultural anthropology at Freie Universität Berlin with a specialization in medical anthropology and the anthropology of religion. He has worked on the dynamics of care and support in the context of HIV/AIDS and rural to urban migration in Tanzania. He has also done research on Christian and Muslim relations in urban settings and the way religious organizations have become involved in the establishing of schools and development projects. Kristina Dohrn is a research associate and lecturer as well as PhD candidate at the Institute of Social and Cultural Anthropology, Freie Universität Berlin. Her research and teaching interests lie in the intersection of the anthropology of religion, migration and transnationalism and the anthropology of education and learning. Regionally, she focuses on Tanzania, Turkey as well as on migratory contexts in Germany. In her ongoing PhD research, Dohrn explores the educational activities of the Gülen Movement between Tanzania and Turkey.